The Short Brothers were awarded a contract by the Royal Air Force in the mid-1930s to develop a flying boat that could provide long-range/long-endurance patrol aircraft. Developed from the S.23 Empire flying boat, the Sunderland (designated model S.25) was revised for military applications including defensive armament, offensive bombs/depth charges, and radar. In the early days of World War II, the initial offensive armament was ineffective and anti-submarine warfare was still in its infancy. Nevertheless, the Sunderland demonstrated its versatility early in its service by rescuing the entire 34-person crew of the Kensington Court torpedoed by the Germans. As newer weapons and lessons learned were brought together, the Sunderland design evolved to incorporate more powerful engines, better radar, and far more effective weapons as it served Coastal Command in the North Atlantic and was deployed into other theaters as well as into other wartime and post-war air arms including Australia, Canada, France, New Zealand, Norway, Portugal, and South Africa. 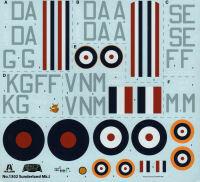 As you can see in the images, the kit isn't really complex but is rated as experienced skill level due to the photo-etched parts. Even in 1/72 scale, this is still going to be an impressive model! 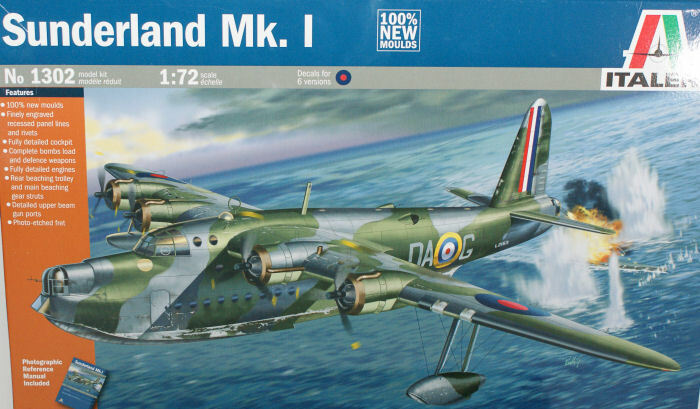 This is a very nice looking kit of the early Sunderland and is produced with the new CAD-based technologies that make these new Italeri models far more detailed as well as far easier to build. You can see the difference these CAD designs also have with the quality of the instructions as well. After building Italeri's recent Wessex HU.5 kit, I'm very impressed with these new kits. We'll see soon how well this latest release goes together as well.